it's all the fault of the gulf stream apparently. for many a long year, the relatively mild weather, punctuated by gale force winds and lashings of rain (up to three metres per year according to the soporific ewan macgregor on bbc hebrides on monday eve) has been at least partially the reason for green fields, palm trees and a lack of need to wear layer upon layer of winter gear. even in the times when i've had the pleasure of getting drookit in the search for those festive 500 kilometres, i've rarely been frozen too. 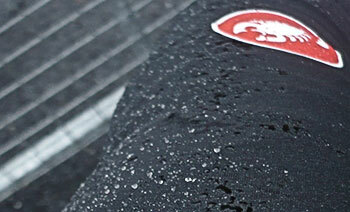 after many a long year, wet and windy is an occupational hazard. but according to those far more meteorologically informed than i, the gulf stream has relocated to somewhere near africa (as if they need it), leaving us to the mercy of siberian winds from the east. it seems almost pointless to inform you that the latter tend to bring with them sub-zero temperatures and large dollops of that snowy stuff. it's considerably less than that savoured by the rest of the country, but largely unexpected and unwarranted on this rock in the atlantic. over a matter of years, if things remain as they are, we'll all become used to our new climate and it will become unremarkable. instead of moaning about the weather, islay's residents will more likely complain about the exorbitant cost of petrol (did you know that the local carrier levies a 10% fuel surcharge on all deliveries to the mainland?). however, in the months prior to everyone releasing their spring/summer catalogue, there is usually endless scope for reviewing waterproof winter apparel. 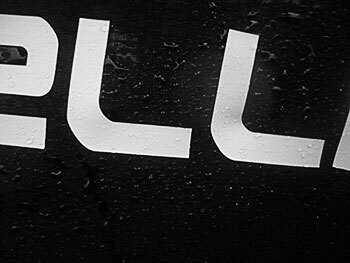 this year, however, has been somewhat embarrassing in this department, for after having been sent the recently reviewed portland design works full metal fenders at the same time as castelli's gabba jersey and nano flex armwarmers, local precipitation was very hard to come by. on the three occasions i remember it raining over the course of four weeks, two were in the evening, and on the one morning when rain was rather self-evident, i was otherwise engaged in alternative activities. everything for me was against me. however, this is the west coast of scotland, and aridity is not a state of affairs that was ever going to last forever. all good rain comes to those who wait, and in this case, the good thing was lashings of rain that continued for an entire day, getting progressively heavier as time ran on. though it caused no end of sniggerings and uncontrolled mirth, these were the very conditions in which a conscientious reviewer (yours truly) throws caution to the wind, saddles up, and heads into such inclemency. which is exactly what i did. i have, on occasion, considered just what it is that passing motorists must think of me as they ease by on the main roads, for i quite plainly have no pressing journey to undertake. i'm rather obviously just out for the ride, but surely on some utterly misguided mission considering the conditions. the mission part is quite correct, but in my terms, misguided is most certainly not true. 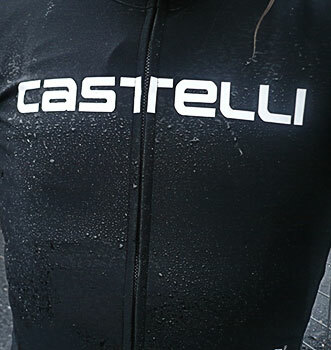 castelli recommend the wearing of the gabba jacket over a couple of layers such as a baselayer and regular short-sleeve jersey, for its impressive thin-ness, coupled with those nano armwarmers ought surely to be sufficient to shelter the honed athlete from the very worst of the elements. as it turned out, that is at least partially true. the gabba jacket is advertised as being highly wind and water resistant, though the lack of taped seams obviates the opportunity to ascribe total waterproofness. and so it turns out; though i will shortly discuss the intermediate stages, i'll cut to the chase and reveal that on return to the croft, i was utterly soaked from head to toe. however, there are factors to be taken into account in respect of my soaking. firstly, i only realised i was soaked on return after an hour in what can best be described as a deluge. the fabric's propensity to retain heat while repelling wind is rather comforting in the face of adversity. secondly, this deluge was aimed directly at me for at least half of the ride by those winds i have paid testament to in the preceding paragraphs. the windproofing of the jacket was never seriously in doubt, and it remained just as slippery when wet. and let's not forget that the gabba jacket was expressly designed for a peloton of racing cyclists, men and women who think little of getting wet through in the course of the working day, mostly because they can shower and change a matter of minutes after crossing the finish line. unlike the rest of us, there are not hours of sitting about in coffee shops, leaving large damp patches on the furniture while huddling round a cappuccino for warmth. nor, indeed, is their place of work devoid of cyclist friendly facilities. 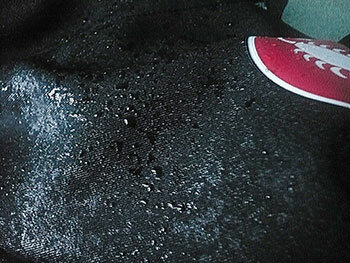 so the fact that the jacket is not completely waterproof is perhaps less of a concern that it is for the great unwashed. however, having watched those endless kilometres ploughed in this year's milan-sanremo, with many a rider clad in said gabba jersey even though castelli is not their apparel sponsor, i am a tad confused. since many of the teams are provided with particularly effective waterproof jackets, i'm somewhat mystified as to why they swapped those for the castelli. don't get me wrong, it's a great jersey, and i daresay it truly comes into its own when doused in light or intermittent showers. an atlantic rainstorm, however, is an entirely different matter. 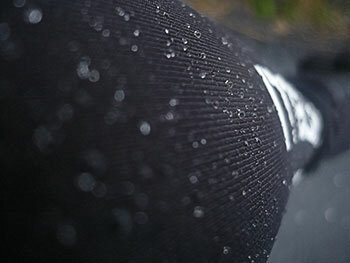 castelli's website offers counselling as to the conditions under which it might perform at its best, and though mild and damp, cool and dry and cool and damp are all highlighted, cold and wintry certainly isn't. so does that mean that milan to sanremo was not the scene of tom boonen's inhuman conditions after all? the gabba jersey is a fantastic garment, perhaps exceeding the claims made for it by its progenitors, but not the panacea for all weathers that several pros might have given us to believe. perhaps it would not be unseemly to advise a modicum of perspicacity when wearing in adverse weather conditions. especially if racing from milan to bowmore.